With Internet growing like anything, the market is flooded with e-commerce websites or portals selling products that are to some extent similar in nature. But then what makes the difference? How could one website be different than others, though selling same products? The answer lies in the presentation and more importantly content. Well when I open a site to buy a product, I first prefer reading the descriptions. If I found them good, then only I take a next step or else I prefer switching to next website. Do you do the same? Perhaps everyone does the same. The power of content is analysed from the fact that 90% of users decide whether to enter a site or not by reading its description on the SERPs. If they are good they enter, else bye bye! This brings a very important point in notice that content writing services are very important and their role is inevitable when it comes to selling products or services online. But wait.. before you jump on a conclusion that content writing services for a general website and an e-commerce website or a portal are same, let me tell you the truth is far away from your imagination. The reason of putting this point is to help you understand your requirement of finding the right content. What kind of content you need for e-commerce website? It needs to be precise, no beating around the bush. How is this content different from other web content or articles? Remaining points of 100% original, no spelling and Grammar errors remain the same. Where to find exclusive product descriptions for e-commerce website? 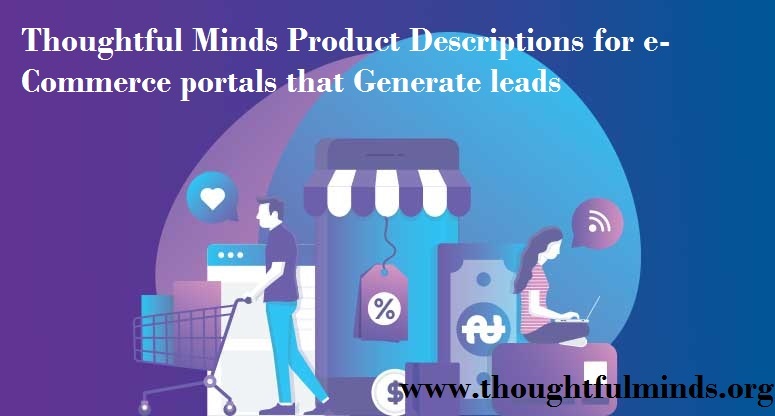 Thoughtful Minds, now crossing 13 years and counted among the top 10 content writing companies in India, has a good capability to deliver product descriptions that actually sell. Already, thousands of companies from all over the world with countries like USA, UK, Australia and UAE apart from India, are taking its services. How to order product descriptions for e-commerce portal? Simply mail your requirements at info@thoughtfulminds.org and sit tight! You will get a response within 2 working hours ( sometimes in odd hours too). INR 1 per word for product descriptions. The price is cheaper for content writing and article writing. Here is the pricing for content writing services for blogs, article writing and SEO content writing.